How Do You Cut Long, Layered Bob Hairstyles? To start cutting a long, layered bob haircut, section off a 1-inch section at the nape of the neck and clip the rest of the hair. This section is a guideline and is cut straight across the neck. Take another section above the first and cut at an angle. Continue cutting each section of the back of the head to an inch below the ear. 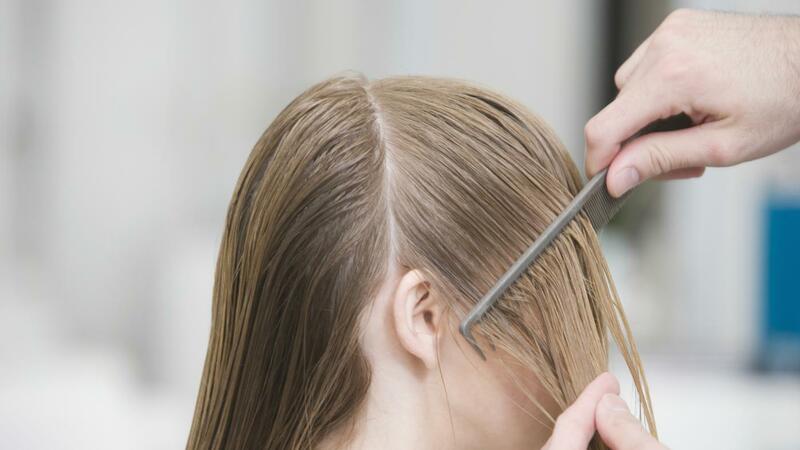 To cut at an angle, pinch the section of hair between the index and middle fingers and pull the hair parallel to you, cutting the ends against your fingers. Cut the center first, then combine sections from the left and right and cut against the guideline. Next, take a top section of hair an inch above the ears and add some of the hair from the bottom section as a length guide and slide the hair through the index and middle fingers. At the ends, with fingers facing downward, cut up along the curve of the head. This creates subtle layers while still using the original guideline to maintain balance. Repeat this from left to right. To shape the front of the bob, pull the front left piece to the original guideline cut. Cutting the front pieces at this angle makes them the longest pieces of the cut. Repeat on the other side and then the middle section of the crown. Pull pieces in the back of the crown up above the head and trim on the round of the head to blend. How Do You Make a Hair Updo? How Do You Cut Short Layered Hair? What Are Good Layered Bob Hairstyles for Black Hair? What Are Some Shaggy Hairstyles for Women?